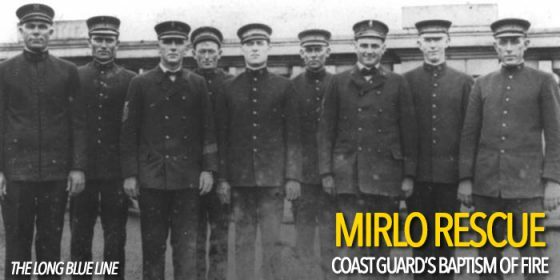 The Life-Saving Service crew that manned the Chicamacomico Station in 1918 when the famous Mirlo rescue took place. U.S. Coast Guard photo. Coast Guard Compass brings us a great story, a wartime rescue of 42 men from a burning gasoline tanker. This entry was posted in History by Chuck Hill. Bookmark the permalink.